We grow zucchini in our garden most summers so we’re lucky to have access to small and taut glossy-skinned zucchini and a supply of flowers, too. 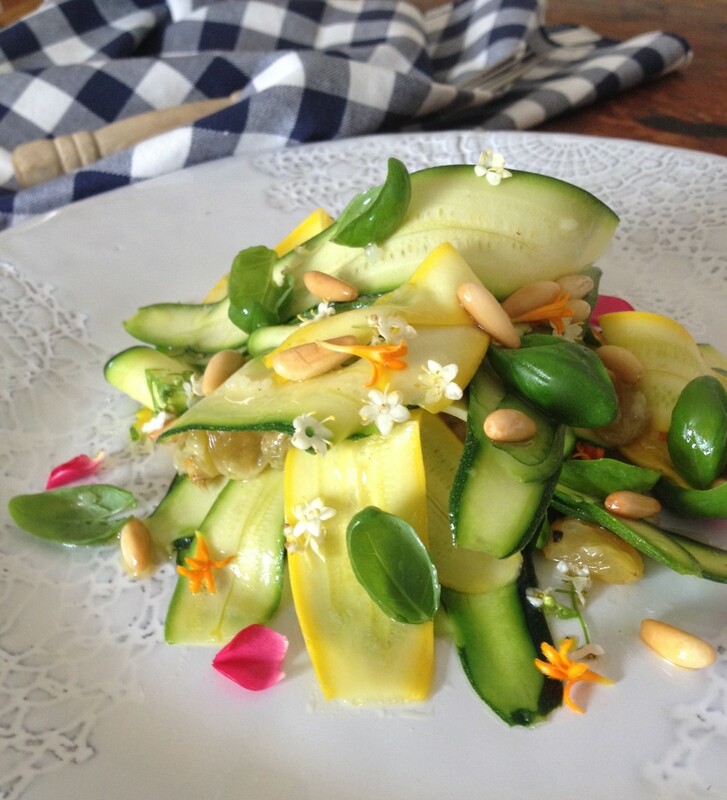 It makes sense to add a few sliced flowers to any dish featuring zucchini, although the trick is to add them at the end of cooking because they quickly wilt. Try them floated on top of a summer vegetable soup – very pretty – or toss them through a vegetable (or clam or prawn) pasta dish just before serving. They’re also good scattered on top of a vegetable or seafood risotto. Sometimes I mix them with eggs and grated parmesan, with or without fried zucchini and garlic, and whip up a quick frittata. Served warm in puffy buns it’s homey fare but pretty tasty nonetheless. Eating them raw without dressing or condiments is like biting into soft fabric and crepe paper all at the same time, not that I’ve done that! And they’re mildly tannic, too. Yep. I definitely prefer them dressed as opposed to au naturel. Scatter them on top of a dressed mixed salad, then give one quick toss and serve immediately. Lovely. That way they’ll retain structure and bounce. Undoubtedly, the favourite way at our place is stuffed and fried (anything fried is always a goer!). Goat’s cheese seasoned with lemon and herbs or with anchovies, a spicy almondy chilli paste, and a fresh pea puree lightened with mascarpone are three ways we like, but you’ll come up with your own flavourings for sure. They’re particularly good dunked in tempura batter and fried, which suits their lightness and delicacy. The trick is not to overfill the flowers, and to keep the filling light, but not runny. If you have access to flowers, pick them early in the morning, while they’re open, remove the pistils, shake, rinse and soak the flowers briefly to free them of insects. Then shake dry and use as required, or wrap each one in paper towels and store in an unsealed plastic bag in the fridge for up to 2 days. 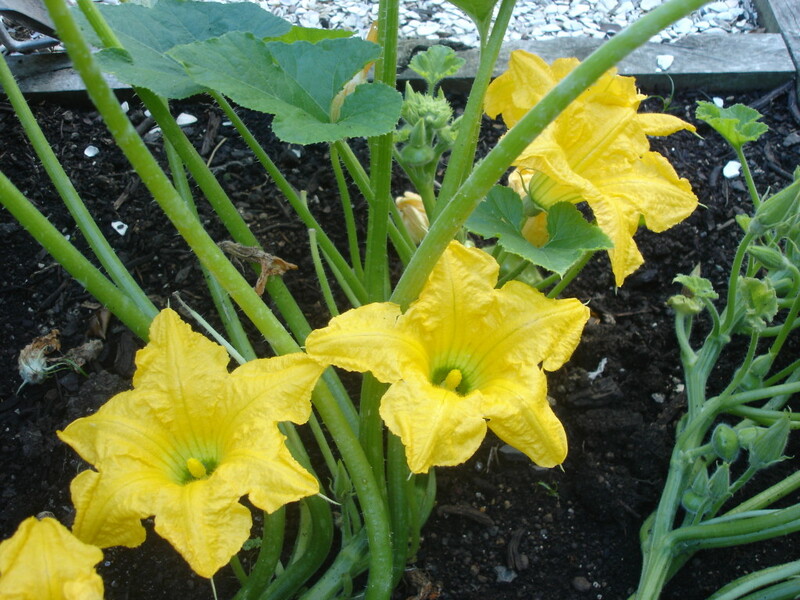 Well that’s the flowers – now for the zucchini! Zucchini are best eaten soon after harvesting, because unlike hard-skinned members of the squash family, they are not long-keepers. Use them up within 2–3 days of purchasing for best results. Moisture makes them rot so remove any plastic packaging and wrap loosely in paper towels before putting them in a plastic bag. Leave the bag untied and store in the fridge. Courgettes, yep, I’ve just hopped over to calling them that (they are one and the same, and I can never decide on one name or the other!) come in several shades of green and yellow, some with paler or contrasting stripes and streaks, and they’re either smooth-skinned or ridged. If you have nice small and taut zucchini they are excellent in salads Summer Zucchini Salad, or lightly steamed and drizzled with fragrant new-season extra virgin olive oil, or lemon-infused oil. If they’re more mature, deal to them with gruntier flavours such as garlic, chilli, pungent herbs or heady spices. Yep, sizzled, sautéed, stir-fried, grilled, baked or roasted, zucchini are pretty versatile. Hi Julie , someone gave us some rampicini (I think that’s what it is called ) Trombone zucchini . Like it so much as it isn’t watery when cooked a bit longer than normal. Goes with all sorts. Lucky you. Save some seeds so you can plant them next year. Char-grilled lamb – simply scrumptious! Gorgeously succulent, lean and tasty. Yeah! A little blob of yoghurt and mint leaf keeps the fritter flavour clean and bright. You'll be back for more!